Bania.io lets you send an email to WalkEveryDay@bania.io whenever you take a walk and the website will start giving you output, charts with proper shades and a productivity chain for your tasks that you regularly email to bania.io. You can send emails for WeekendHike@bania.io every weekend and it will record how often you have missed your hikes on weekends. There is no login involved and no settings needed, the charts are automatically sent to your email inbox so there's no need of an extra layer of security. Like my previous post about FollowUpThen, the focus is on getting your email to work for you right from your inbox instead of logging in to different websites, maintaining accounts. Email is something that has already been made secure and easy to handle. There would be almost no one on the internet that would not use email. Getting most out of email is one of the simplest way of productivity hacking and bania.io gives you the clean graphical side of it. 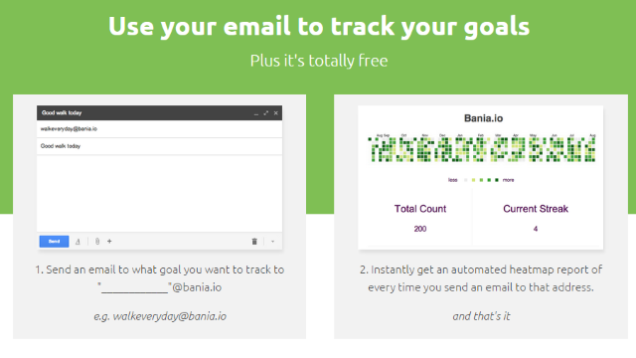 On every email, Bania.io replies you with a heatmap of your streak. As you keep repeating, the chart spreads over the calender letting you find out how regular you have been over days and months.